Leaves and stems glabrous, especially when young, from a stout, horizontal rootstock, one-half to I inch thick, densely clothed with thick, fibrous roots. Juice of the roots and stems red. Leaves basal on petioles 6 to 14 inches long, palmately five to nine-lobed, the lobes repand or cleft at the apex and palmately veined. Flowering scapes, one-flowered, at length overtopped by the mature leaves, but at flowering time longer than the partially unfolded immature leaves. 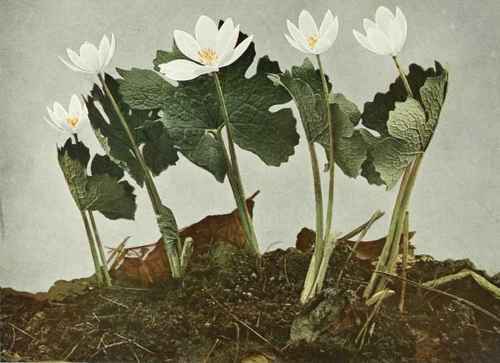 Flowers white or sometimes pinkish, 1 to 1½ inches broad; sepals two, soon falling. Petals eight to sixteen, oblong-spatulate, arranged in two or three rows and soon falling; stamens numerous, yellow. Fruit a narrow, one-celled, two-valved capsule, pointed at both ends, about 1 inch long. In rich woods and on shaded banks, Nova Scotia to Manitoba and Nebraska, south to Florida, Alabama and Arkansas. Flowering in April and May.